Need more information about booking Home 376383 ? Villa Dimitra is approved by Greek Tourism Organisation & managed by "etouri vacation rental management". Villa Dimitra is a two-story country house of 200 sqm which has been restored and renovated with respect for tradition. The building was originally constructed in 1800. In 1998, the owner renovated the house with respect to its history and transformed it into a traditional villa, where you can relax and enjoy the Cretan country side. Outdoors you can find a 70 sqm large garden with a large wooden table, the 25 sqm swimming pool, a barbecue, a traditional wood oven, a marble sink, facilities for cooking outside, sun beds with tables, plenty of places to sit and enjoy the magnificent view and private parking space for 2 cars. There is also a large fruits garden next to the villa with many varieties of fruit trees such as orange, fig, lemon, medlar, pear, apple, peach, apricot, and mandarin. Moreover in the yard and garden of the villa you will find 10 to 15 different varieties of organic grapes which are grown from June to October. You can enjoy all of our fruits and vegetables with your meal! 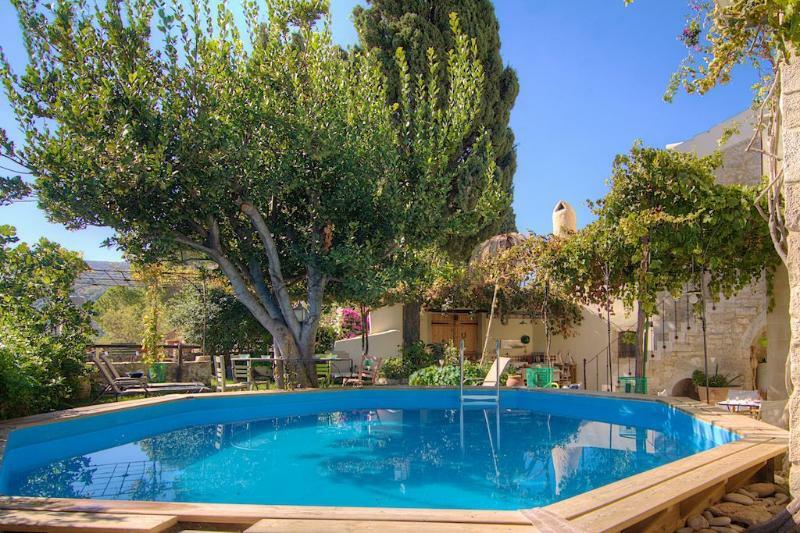 Villa Dimitra can accommodate 6 guests in 3 bedrooms which have double beds. Furthermore, there is a possibility to accommodate 2 more people (total 8), as the 2 comfortable couches can easily be converted into beds. There are also 2 bathrooms with shower and laundry for guests' convenience. Entering the house, there is an open-plan area of 33 sqm which includes a dining table for 6 people, a sofa-bed, the living room area with the TV and DVD player, a small room where you can find the washing machine and a bathroom. Right next to the living room area is the fully-equipped separate kitchen. On the ground floor there is also a dining table for 8 people and one more living room area with 3 sofa-beds. Finally the first double-bedded bedroom is located at the end of the ground floor, offering direct access to a veranda its own sitting area and to the garden of the house. Going up the wooden staircase, you will find the remaining 2 double-bedded bedrooms and a beautiful terrace with great view, which also has direct access to the villa's garden. One of the two bedrooms has an en-suite bathroom. The villa was built by John Chaliopoulou monk in 1800, who also renovated the existing main church of the village, Church of the Life Giving Fountain. In 1998 the house was bought by its current owners, who restored it as it is today. Situated in an area of exceptional natural beauty, surrounded by gardens with flowers and trees, not just a cottage or vacation cradle. Located on the highest point of the village inhabited by Venetians who left old Venetian buildings, offering stunning views of the Cretan Sea, Mount Psiloritis and surrounding lush mountains and gorges area. This Villa has 3 bedrooms, 2 bathrooms and sleeps 8. It’s been listed on Holiday Lettings since 03 May 2013. Located in Rethymnon, it has 16 reviews with an overall rating of 4.5. The average weekly rate varies from £789 to £1213. We were met by owners of Villa Dimitra with a glass of raki and nibbles before being shown around the beautifully restored property with spectacular views. It was a very hot week and we were grateful for the vine-covered pergolas shading the garden. The house was cool and air-conditioned bedrooms welcome. The local taverna run by Maria and George was good but if you wanted to eat further afield there were a variety of eateries within an 8-mile radius. Our favourites were Thavma and Knossos. The buzz of Rethymno made a good contrast to the tranquility of the villa. Batteries recharged!